This costume raises some questions. First, did this juvenile offender escape prison… by dying and coming back to life as a zombie? It was a pretty diabolical plan, but apparently, it worked. And now not only is he free, but he doesn’t have to eat those terrible prison meals anymore! All he’s hungry for now is brains. Lots and lots of brains. Let your child scare the neighbors once when they see the prison uniform and again when they see the undead visage in this frightening costume. And if you're some kind of Hollywood producer reading this, how about a child prisoner who becomes a zombie? You say high-concept, I say hat-on-a-hat, but one thing’s for sure: this costume has a backstory! Maybe this will finally begin a franchise! 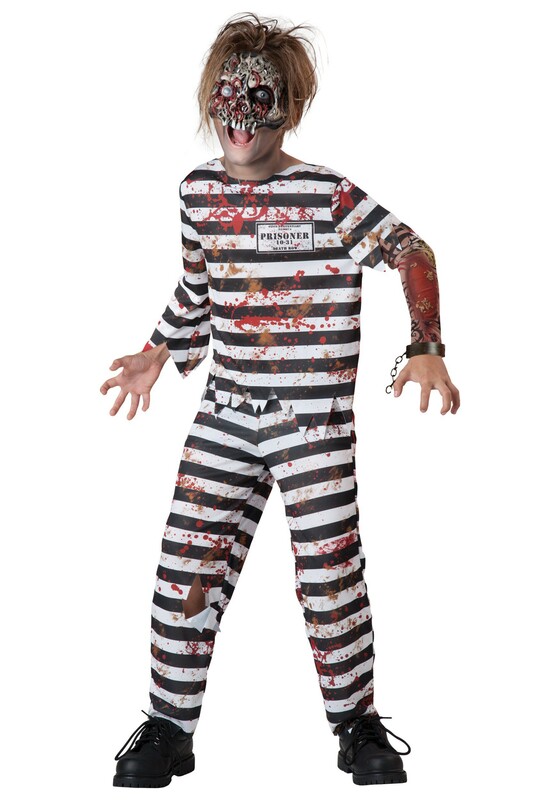 This Child Creepy Convict Costume includes a striped pullover shirt with jagged edges and striped pants with an elastic waistband and jagged cuffs at the bottom because you know whatever this child zombie prisoner’s been through, it will have messed up his clothes. No orange jumpsuit for this convict! Maybe he’s not a new zombie? There’s a mesh sleeve for lower left arm with a tattoo print––adding yet another detail for this youngster’s colorful backstory, whether we assume he got his ink pre- or post-mortem––and both top and bottom are covered in printed dirt and blood stains for that “just dug my way out of the cemetery with my bare hands” look that’s all the rage this year. A plastic shackle attaches to the wrist with a snap fastener and has a 5-inch-long plastic chain. A molded vinyl mask covers the upper half of the wearer’s face. We’re trusting the bottom half is so similar no one will notice. Har har! Let your child run free on good behavior in this creepy and unconventional zombie convict costume!